The revolutionary Tamiya Hornet off-road buggy in 1/10th scale is back and more fun than ever before! 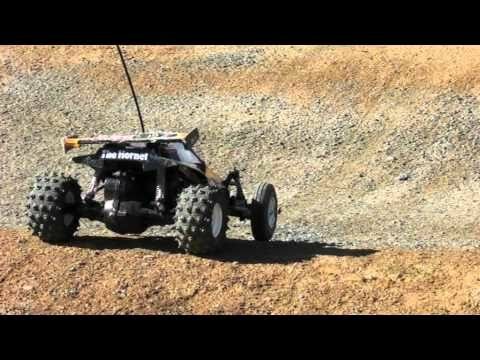 The Hornet stands as one of Tamiya's most popular R/C cars ever released, helping launch a 2WD R/C buggy boom worldwide. The Tamiya The Hornet Features an excellent performance rating on both dirt and on-road tracks, this awesome radio control buggy can take on any type of terrain. Just like the original, this re-release features an easy to assemble chassis and drivetrain consisting of a durable but lightweight ABS resin bathtub frame, diff gear loaded sealed gearbox, oil filled rear dampers, powerful RS 540 motor and high performance suspension system. The Tamiya Hornet is perfect for those that used to have one, those that have always wanted one, and for those that want a revolutionary buggy that has earned its place in R/C history. Great price and fast delivery from Wonderland. To summarize - excellent kit, fun to build & drive after for my sons (& myself !!). I always wanted an RC kit, but never got one; so took the opportunity to get the Hornet that I remembered for my kids and myself. As ever, excellent Tamiya instructions and build - clear and simple, yet fun. The car is good to run inside & out, adding to the opportunities to drive it. good fun building, looks amazing. i have had hours of fun with the hornet. An excellent service by the staff at Wonderland Models who helped me get my son a great Xmas present. The package arrived safely by courier in Australia, and is exactly as described. item arrived quickly and all my emails were answered the same day.great advice given.loved building the car and running it for the first time. will be buying my next rc from wonderland.many thanks.great service. A great product that's of classic design. I enjoyed this build immensely. Brilliant, I have always wanted to build one of these and its exactly how I expected it to be. My kids love it too. Well worth it. Bought the car as a gift for my husband and he was delighted with it. He had always wanted such a model when he was younger and he wasn't disappointed. He had it built and moving within a day of opening his present and had its full shell on pretty soon after. A big success! Apparently I've released my inner 13yr old again - I'm now 38! Had one of these when they came out first time round. Finally got round to getting a new one. Great toy, building it's still good fun, and I even remembered the mod to stop the battery cover coming off. If you had one of these first time round, get another one. If you've only just found RC modelling, get one. Good fun, good price, great service. Ordered this for our son day before Xmas eve as we thought this make a great present me having one in 84 it brought back some fantastic memories. Turned up next day which we thought was excellent being Xmas. Kits great, just as I remember it, could just do with some paint in the kit is the only let down really. Fantastic kit though, great price and fantastic service from these guys.